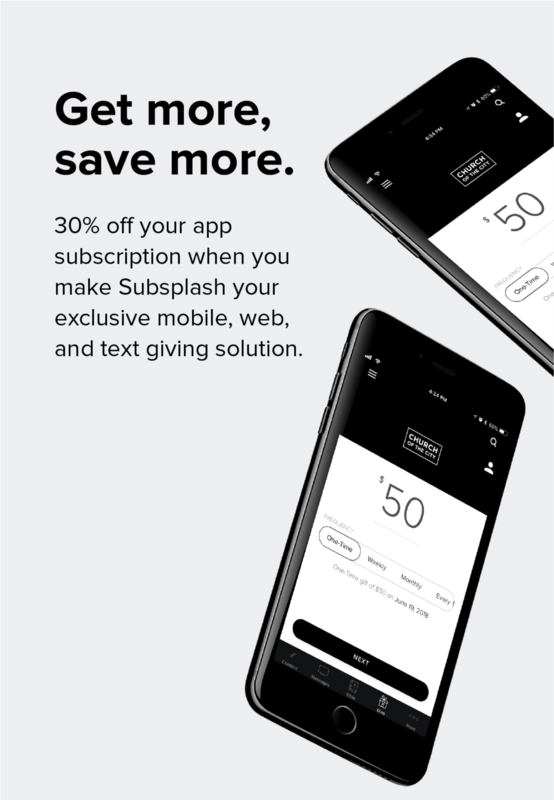 Go all in with the Subsplash Guarantee — Subsplash.com | Engage your audience like never before. Fuel Your Mission™ and increase giving engagement with the Subsplash Exclusive Guarantee. Engage your donors with the best cross-platform giving experience, and see the results pay for themselves. We’re passionate about helping your ministry succeed, so when you go all in with Subsplash Giving, we’ll support your launch and guarantee growth. Our promise: See your total donations increase after one year, or get your second year of Subsplash services free. I have reviewed the terms of the Subsplash Exclusive Guarantee. As an authorized representative of my organization, I accept these terms. It’s simple. Subsplash will help you grow your church donations when you use Subsplash Giving as your exclusive solution.